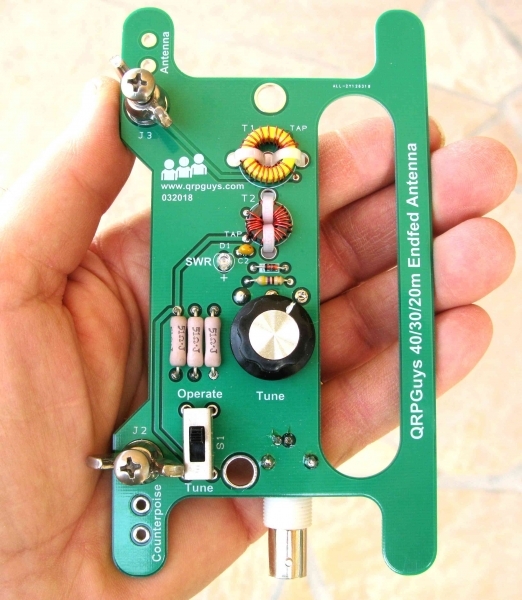 The QRPGuys Portable Multi-Band End Fed Antenna is designed as a portable 40/30/20m two trap wire antenna with a built-in tuner and SWR indicator. It consists of a main board with tuner and SWR indicator, two trap pcb’s and an end wire support. It incorporates the N7VE led SWR indicator and has a board mounted female BNC for connection to your rig. The built-in absorption bridge design will ensure you do not damage your finals with a poor SWR. Our test show and SWR of 1:1 on 20m, 1.1:1 on 30m, and 1.3:1 or better on 40m. It is rated for 5 watts continuous, 10 watts PEP. The kit comes complete except for the user supplied #22-24awg wire for the elements. All S.S. connection hardware for the radiator and counterpoise connections. The tools required are a soldering iron with a small tip, rosin core solder, small side cutters, and can be built in an hour or two. On a difficulty scale of 1 to 5, 5 being the most difficult, this is rated at 2.